ROLAND HOGAN BEGAY was born southwest of Gallup in the "Checkerboard" area of the Navajo Indian reservation. It has that name because the land is interspersed with private ranches. 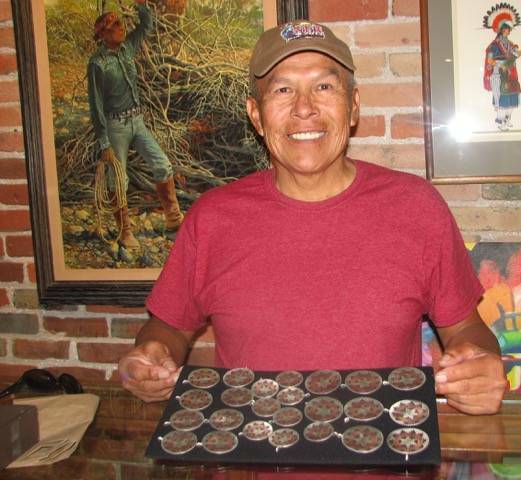 Roland went to boarding school in Gallup and spent summers working on a ranch. He learned about horses and raised and trained barrel horses. He competed in rodeos for several years. Roland's wife, Geneva, is a championship barrel racer. His father, who Roland says could do anything with his hands, taught him leatherworking and how to make saddles. A good saddle goes for a lot of money and Roland's were in demand. He also began silversmithing and in 1974 he began working in the unique style that has made him well known to Indian jewelry collectors. Begay creates scenes from Navajo life using an overlay technique in which he cuts out silver hogans, people, horses, corrals and other items you'd expect in a traditional Navajo setting. He then solders them to a background of silver or gold. He also creates miniature Navajo baskets of silver and copper. All of Roland's pieces are available in 14 karat gold or sterling silver. The silver may be ordered with oxidized background (black), plain silver background or stippled (bright white) background. All bracelets are available in 14 karat gold.